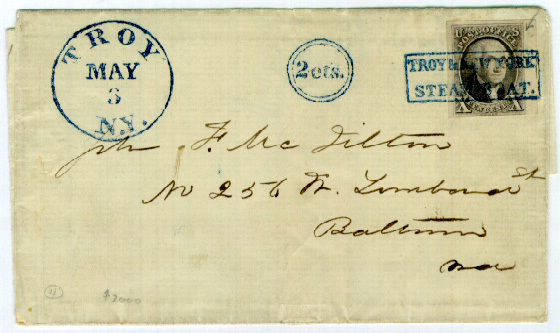 DESCRIPTION: A folded letter sheet franked with a single 1847 issue 10¢ stamp, postmarked with a blue TROY/MAY 3/N.Y. circle date stamp, handstamped with a blue 2 cts. in double circle marking, and canceled with a boxed blue rectangular TROY & NEW YORK STEAMBOAT marking, addressed to Baltimore. APPARENT USAGE: Single rate, over 300 miles, prepaid letter from an unknown origin to Baltimore carried initially to Troy by steamboat where it entered the mails, with two cent fee paid to steamboat captain by the Troy postmaster and subsequently due from the addressee on delivery at destination. ANALYSIS: This cover, shown at Figure 1, is a folded, one page sheet without contents bearing an address to Baltimore with a 10¢ 1847 issue stamp. The front of the cover has three matching blue markings: one a dated Troy, NY town postmark; one a 2 cts. in double circle handstamp; and one a well-known TROY & NEW YORK STEAMBOAT in rectangular frame handstamp used as a cancellation. It also bears on the front a pencil price “$2000” and on the back in pencil “March 24 1963/PWWW” and “79-09-2,” as well as a handstamp “1847 J Waldo Sampson” in triangular format. The paper is old laid, slightly blue with rag content consistent with the alleged period of usage. Also, the inked address seems contemporary to the period and genuine. The lack of a letter is not rare for covers of this period, but it does raise suspicions, as no letter could be one factor indicating the cover might have had other origins. The stamp has four large margins and no discernible defects. There is a light, but perceivable, pen marking similar to a pen cancel, present in the stamp’s upper right corner, that may indicate a prior use. Some covers are known with both handstamp and manuscript stamp cancellations. However, given the fact that three separate handstamps are present on this cover, it is unlikely the postmaster would have also used a manuscript marking. With respect to the handstamped impressions themselves, the Troy Post Office often produced well-struck markings on covers of this period. In this case, the lettering of all three markings is fat and fuzzy, not sharp and thin like the genuine period markings. This is particularly true of the rectangular mark. It is slightly larger in both dimensions with lettering thicker than all other genuine copies known. All genuine markings seen, such as the one shown in figure 2, have contained finer and more delicate letters than found on this cover. The larger letters cannot be explained away as being a strong, as opposed to glancing, strike. None of the letters appears out of place or alignment. With respect to their color, the blue is not quite right, being a bit too much toward Prussian blue than genuine examples. Section 1 of the Act of Congress approved March 3, 1845 modified postage rates on a single letter to five cents per half ounce if conveyed in the mail, for any distance under three hundred miles … and for any distance over three hundred miles, ten cents. The post road distance from Troy to Baltimore was over 300 miles in 1847, so the letter is properly rated at 10 cents. The markings taken together would indicate this letter was initially carried to Troy by steamboat. The same Act of 1845 specifically stated that the section (6) on steamboat mails in the earlier 1825 Act was to remain in effect. The 1825 Act required the local postmaster to pay a steamboat captain two cents for every letter or packet so delivered [on time], unless the same shall be carried or conveyed under a contract with the Postmaster General. The 2 cts. 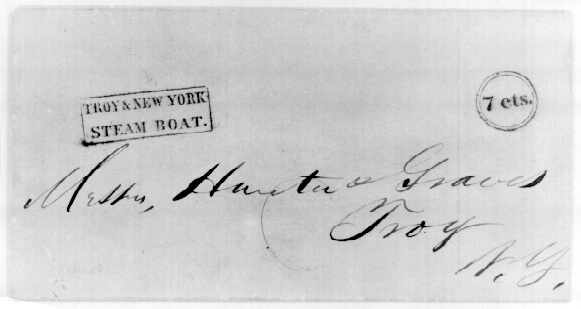 in double circle handstamp marking would mean that the letter must not have been carried on a contract steamboat to Troy where it entered the mails. The indicated two cents paid at Troy to the steamboat captain was to be collected due when the letter was delivered, thus, completing a clever matching of faked markings similar to a genuine usage. CONCLUSION: Although the stamp, cover paper, and address seem genuine, the stamp did not originate on this cover, and all three postal markings are spurious and have been added.